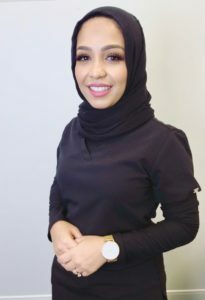 Alaa Hamadto is a licensed Master Aesthetician at NOVA Plastic Surgery and specializes in skin care and laser treatments, including HydraFacial, Dermaplaning, Microneedling, and Laser Hair Removal. She has been in the aesthetic industry for over 8 years working closely with dermatologists and medical aestheticians. Alaa loves helping her patients achieve the best results possible, while also educating them on how to love and care for their skin and its’ needs. Alaa received her Bachelor’s in Pharmacy in 2009 at the University of Medical Sciences and Technology in Khartoum/Sudan. Afterwards, she received her CIBTAC and CIDESCO diplomas at The London School Of Beauty & Makeup in 2010, which is one of the world world’s prestigious qualifications for Aesthetics and Beauty Therapy. In 2015, she was awarded the “Expert” degree by The International Dermal Institute. Alaa is very excited to be a part of the NOVA PS family and to have her clients leave her treatment room happy!